More than 300 films on, Kader Khan was always more than the sum of his roles, the consummate multi-hyphenated Bollywood artiste for those who grew up in the 1980s and 1990s on a staple diet of commercial films that either featured him or were penned by him. 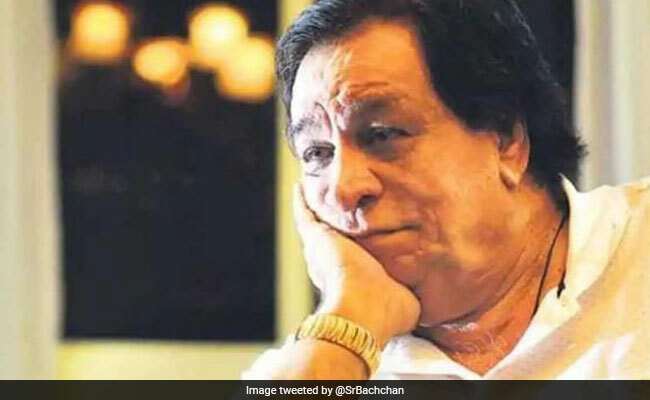 Engineer-scriptwriter-actor-dialogue writer, Kader Khan, who died in Toronto at the age of 81 before he could see the dawn of a New Year, was all these and more. Kader Khan was that rare film personality who was equally important on screen and off screen with about 300 roles as an actor and writing credits in over 250 films. Before he slipped into the skin of his characters on screen - playing the buffoon, controlling father and villain in a range of films good and bad - Kader Khan took his first tentative steps in Bollywood as a back-end writer giving shape to storylines. The Kabul-born Pathan started his career as a professor of civil engineering before being pulled into the world of showbiz as a writer. Kader Khan was famously spotted by screen legend Dilip Kumar while he was performing in a play at his college's Annual Day function. It was the era of grand commercial films and the romantic hero of the 1960s and the early 1970s was already ceding ground to the 'angry young man', embodied by Amitabh Bachchan. In 1972, he made his debut as a writer with the Jaya Bhaduri-Randhir Kapoor teen romance Jawani Diwani, still remembered for its music and its portrayal of young love. Kader Khan went on to deliver some of Bollywood's best written screenplays and whistle-worthy dialogues in blockbuster films such as Amar Akbar Anthony and Shola Aur Shabnam. He stepped in to help shape Amitabh Bachchan's career after Salim-Javed, who wrote Zanjeer and Sholay, went their separate ways in 1982. It was Kader Khan who gave Amitabh Bachchan some of his career's biggest hits with memorable dialogues and writing in a series of films - Sharaabi, Lawaaris, Muqaddar Ka Sikander, Naseeb and Agneepath, for which the megastar won his first Best Actor National Film Award in 1991. Kader Khan and Amitabh Bachchan were the thread that tied rivals Manmohan Desai and Prakash Mehra. The civil engineer-turned-hit writer also helped cement Govinda's career with his sharp dialogue and screenplays in Coolie No 1, Raja Babu and Saajan Chale Sasural. The troika of filmmaker David Dhawan, actor Govinda and actor-writer Kader Khan produced a number of hit comedies, including Hero No 1 and Dulhe Raja. All the while, Khan was also acting in a variety of films. In 1973, a year after he wrote Jawani Diwani, Khan made his acting debut with Rajesh Khanna-Sharmila Tagore's Daag in the supporting role of a prosecuting attorney. He established his presence as an actor with roles in Dil Diwana, Muqaddar Ka Sikandar and Mr Natwarlal before evolving as a performer with impeccable comic timing. There was scarcely any potboiler from the 1990s that did not feature the actor Khan -- Kishen Kanhaiya, Bol Radha Bol, Aankhen, Coolie No 1, Hero No 1, Dulhe Raja, the films were many. As an actor, he will be remembered for striking a balance between comedies and dramas, sometimes exploring the grey side. Some of his stand-out performances are as the old Sufi who guides a lost child in Muqaddar Ka Sikandar, the Yamraj who gets tricked by a human in Taqdeerwala, the greedy employee who kills his boss in Khoon Bhari Maang, the Type-A controlling father in Hero No 1 and the epic Duggal sahib who, on some days, is blind, deaf or speechless in Mujhse Shaadi Karogi. Kader Khan was a two-time recipient of the Filmfare Award for Best Dialogue for Meri Awaaz SunoM (1982) and Angaar (1993). He also won the Best Comedian Filmfare for Baap Numbri Beta Dus Numbri (1991). As the years rolled by, the roles dwindled. His last appearance on screen was in 2017 in the forgotten film Masti Nahi Sasti. Before that, he was seen in Tevar (2015). He never officially retired but, in his own words, was somewhat lost in oblivion. "Some people refused to keep me with them. I was a little unwell. And people refused to take me back into their films," Khan said at the trailer launch of his comedy Hogaya Dimaagh Ka Dahi in 2015. He had started keeping unwell by then. He said he wanted to make a comeback as a writer and could tell that there was a "difference in the level of writing". "As a writer, I feel that I should come back. I'll try my best to bring the earlier zubaan (language) back and people are definitely going to enjoy talking in that zubaan," he told reporters. The starry lights of Mumbai were no longer appealing and some years ago, the actor moved to Toronto to be with his son. And on the final day of 2018, he slipped into a coma in faraway Toronto, never to wake up. Kader Khan's Son Sarfaraz On His Bollywood Career: "It Was Fulfilling While It Lasted"